Genomic expression in eukaryotes is considerably more complex than in prokaryotes, and you will need to know those differences for Test Day. Regulation of gene expression is an essential feature that helps in maintaining the overall functionality of cells. In addition to basic transcriptional enzymes, however, there are a host of other regulatory proteins that play a prominent role in controlling gene expression levels in the cell. Transcription factors are transcription-activating proteins that search the DNA looking for specific DNA-binding motifs. Transcription factors tend to have two recognizable domains: a DNA-binding domain and an activation domain. The DNA-binding domain binds to a specific nucleotide sequence in the promoter region or to a DNA response element (a sequence of DNA that binds only to specific transcription factors) to help in the recruitment of transcriptional machinery. The activation domain allows for the binding of several transcription factors and other important regulatory proteins, such as RNA polymerase and histone acetylases, which function in the remodeling of the chromatin structure. Once the transcription complex is formed, basal (or low-level) transcription can begin and maintain moderate, but adequate, levels of the protein encoded by this gene in the cell. There are times, however, when the expression must be increased, or amplified, in response to specific signals such as hormones, growth factors, and other intracellular conditions. Eukaryotic cells accomplish this through enhancers and gene duplication. The DNA regulatory base sequences (such as promoters, enhancers, and response elements) are known as cis regulators because they are in the same vicinity as the gene they control. Transcription factors, however, have to be produced and translocated back to the nucleus; thus they are called trans regulators because they travel through the cell to their point of action. 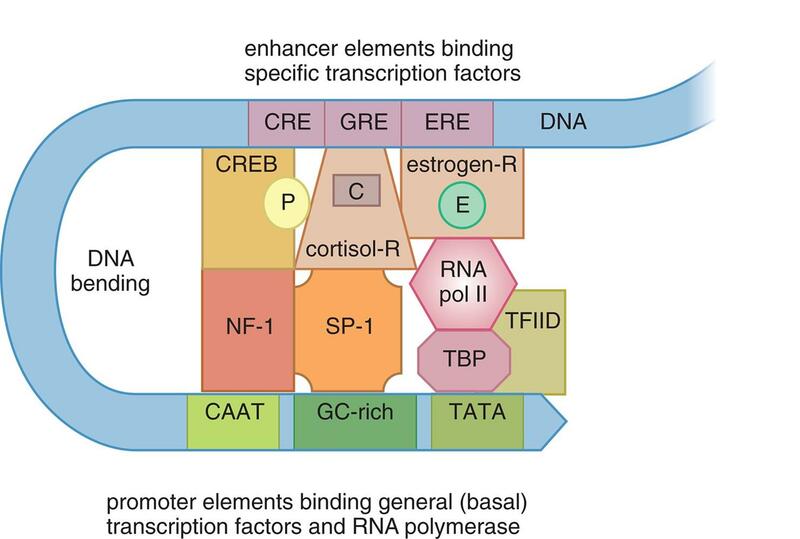 Response elements outside the normal promoter regions can be recognized by specific transcription factors to enhance transcription levels. Several response elements may be grouped together to form an enhancer, which allows for the control of one gene's expression by multiple signals. Figure 7.17 demonstrates a eukaryotic example of an enhancer. Signal molecules, like cyclic AMP (cAMP), cortisol, and estrogen, bind to specific receptors. For the examples given, these receptors are cyclic AMP response element-binding protein (CREB), the glucocorticoid (cortisol) receptor, and the estrogen receptor, respectively; all are transcription factors that bind to their respective response elements within the enhancer. Other proteins are involved in this process, but are outside the scope of the MCAT. Note that the large distance between the enhancer and promoter regions for a given gene means that DNA often must bend into a hairpin loop to bring these elements together spatially. Enhancer regions in the DNA can be up to 1000 base pairs away from the gene they regulate and can even be located within an intron, or noncoding region, of the gene. They differ from upstream promoter elements in their locations because upstream promoter elements must be within 25 bases of the start of a gene. By utilizing enhancer regions, genes have an increased likelihood to be amplified because of the variety of signals that can increase transcription levels. Cells can also increase the expression of a gene product by duplicating the relevant gene. Genes can be duplicated in series on the same chromosome, yielding many copies in a row of the same genetic information. Genes can also be duplicated in parallel by opening the gene with helicases and permitting DNA replication only of that gene; cells can continue replicating the gene until hundreds of copies of the gene exist in parallel on the same chromosome. In eukaryotic cells, DNA is packaged in the nucleus as chromatin, which requires chromatin remodeling to allow transcription factors and the transcriptional machinery easier access to the DNA. Heterochromatin is tightly coiled DNA that appears dark under the microscope; its tight coiling makes it inaccessible to the transcription machinery, so these genes are inactive. Euchromatin, on the other hand, is looser and appears light under the microscope; the transcription machinery can access the genes of interest, so these genes are active. Remodeling of the chromatin structures regulates gene expression levels in the cell. Transcription factors that bind to the DNA can recruit other coactivators such as histone acetylases. These proteins are involved in chromatin remodeling, as shown in Figure 7.18, because they acetylate lysine residues found in the amino terminal tail regions of histone proteins. 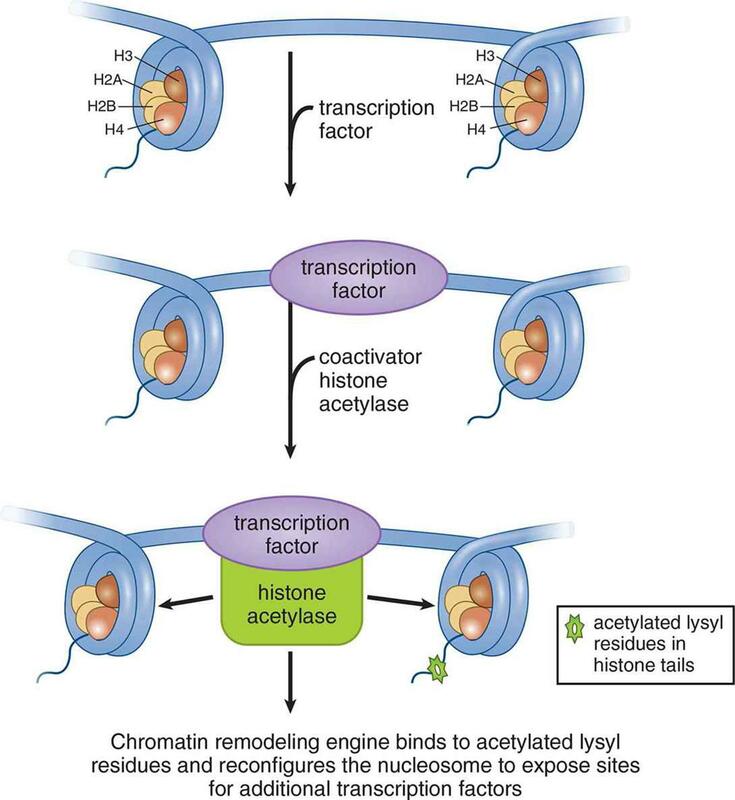 Acetylationof histone proteins decreases the positive charge on lysine residues and weakens the interaction of the histone with DNA, resulting in an open chromatin conformation that allows for easier access of the transcriptional machinery to the DNA. Figure 7.18. Chromatin Remodeling by Acetylation Increases space between histones, allowing better access to DNA for transcription factors. Specific patterns of histone acetylation can lead to increased gene expression levels. On the other hand, gene silencing can occur just as easily with chromatin remodeling. Histone deacetylases are proteins that function to remove acetyl groups from histones, which results in a closed chromatin conformation and overall decrease in gene expression levels in the cell. DNA methylation is also involved in chromatin remodeling and regulation of gene expression levels in the cell. DNA methylases add methyl groups to cytosine and adenine nucleotides; methylation of genes is often linked with the silencing of gene expression. During development, methylation plays an important role in silencing genes that no longer need to be activated. Heterochromatin regions of the DNA are much more heavily methylated, hindering access of the transcriptional machinery to the DNA. 1. In an enhancer, what are the differences between signal molecules, transcription factors, and response elements? 2. By what histone and DNA modifications can genes be silenced in eukaryotic cells? Would these processes increase the proportion of heterochromatin or euchromatin?